When expectant mothers have supportive partners that want to be involved in the preparation for their baby’s birth, Hypnobabies Childbirth Hypnosis classes provide the tools for them to do so with confidence! It’s not unusual for Birth Partners to be skeptical at first about childbirth hypnosis, or concerned that the expectant mother will simply listen to hypnosis tracks, leaving him/her without a significant role during the baby’s birth. Hypnobabies Birth Partners quickly learn that their concerns are unfounded when they learn that hypnosis is a normal state of mind that people experience every day, and that they have a very hands-on role in the process of helping the mother prepare for and experience an easier, more comfortable birth. The first Hypnobabies lesson dispels the misconceptions that many have about hypnosis. Birth Partners experience hypnosis along with the expectant mother during Class One’s “Learning Self-Hypnosis” script. They are surprised to learn that hypnosis is actually quite pleasant, very relaxing, and even fun. “That’s it?”, and “All I felt was very relaxed.”, and “I enjoyed it a lot…it wasn’t weird at all!” are the excited comments our instructors hear from our Birth Partners at the end of that first script. What Will the Birth Partner Learn in Hypnobabies Classes? What Hypnobabies Childbirth Hypnosis is and how the techniques work. How he/she can help mom stay healthy and low-risk by supporting good nutrition choices. About the importance of the mother doing prenatal exercises during pregnancy to prepare her body for birth. How to determine what position their baby is in based on baby’s kicks and wiggles! That reading hypnosis scripts to the mother will compound the effect of childbirth hypnosis through repetition. That reading hypnosis scripts to mom creates pleasant-feeling brain chemicals like endorphins, oxytocin and dopamine in mom’s body that the baby responds to by ‘playing’ inside her tummy. 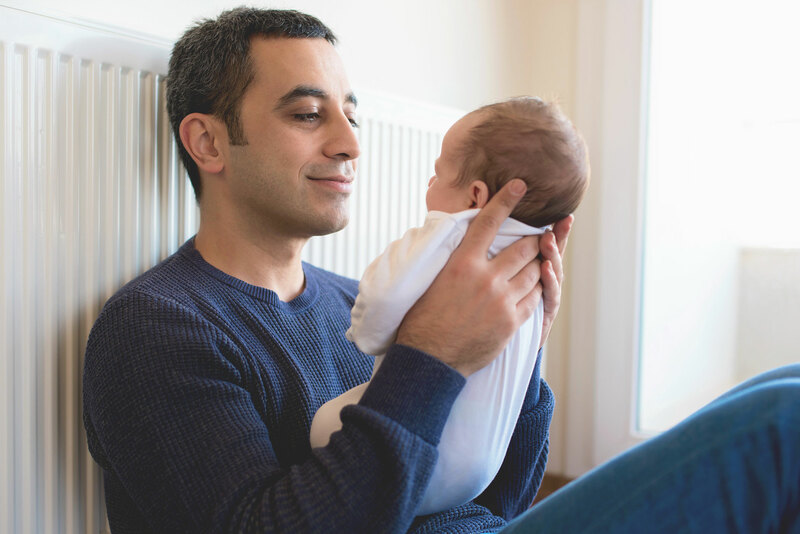 That babies hear the Birth Partner’s voice during script-reading sessions and learn to associate the Birth Partner’s voice with that happy ‘play’ time (prenatal bonding!). Information about common procedures during birth, and what the risks, benefits and alternatives are to each routine procedure. This information is necessary for planning a “Birth Preferences” list and a “Baby Care Plan”. Specific questions to ask prenatal care-providers in order to gather the information necessary to make educated decisions during pregnancy, birth, during the immediate postpartum period and for baby’s care. Word cues and touch relaxation cues that can instantly deepen the mother’s hypnosis and comfort level during childbirth. How to time pressure waves (contractions) and how to assess the mother’s progress in birthing. How to use non-hypnosis techniques during birth to help facilitate optimal positioning and the descent of the baby. How to support the progress of their baby’s birth by encouraging physical movement, through demonstrations of positions that help. During a hands-on Birth Rehearsal, how to use the hypnosis prompts from the Birth Partner’s Guide, to keep mom relaxed, focused and more comfortable, also what to do if she briefly loses focus. About normal newborn characteristics, and new baby care, breastfeeding and postpartum care for mom. “Birth Partner Relax and Feel Confident” audio track – this is a Hypnobabies hypnosis session created with the Birth Partner’s specific needs in mind. It boosts the Birth Partner’s confidence in his/her role, and to trust in the mother’s body and her ability to give birth. Birth Partner’s Guide – this is a valuable handbook created just for the Hypnobabies Birth Partner. It includes all of the Hypnobabies tips and tools and reminders in one easy-to-use guide so that Birth Partners can access information quickly during the birth process. Birthing Log – this form provides Birth Partner’s with a list of important things to keep track of during birth like pressure waves, mom’s hydration, position changes, and signs of progress.